We open this week with our fifth-place of counting down our top picks from the latest set: Jirachi (SM – Team Up 99/181; SM – Black Star Promos SM161)! This Basic [M] Type Pokémon with 70 HP, [R] Weakness, [P] Resistance, Retreat Cost [C], the Ability “Stellar Wish”, and the attack “Slap”. Each instance of Stellar Wish you have may only be used once during your turn before you attack or do anything else that would end your turn once it resolves. It also may only be used while Jirachi is your Active Pokémon; look at the top five cards of your deck if you find any Trainers, you may add one of them to your hand after showing it to your opponent. 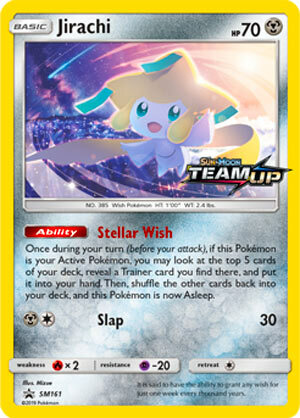 Shuffle your deck (including those cards you saw) afterward, and Jirachi is now Asleep. Slap is far simpler; for [MC] it lets Jirachi attack to do 30 damage. That’s all. Why am I just running through all of this so quickly? Because Jirachi is all about that Ability, and everything else has to be understood through it. Trainers are what drive most decks, which is why they also tend to be the most prolific of the three types of cards. In the average deck, odds are you’ll find something in those top five cards; in decks with Jirachi in mind, odds are good you’ll find something worthwhile in those top five. Being a Basic means Jirachi requires the minimum deck space and time to run; it can even be your opening Active! It does mean that its Ability is more vulnerable to being shut off than if it were an Evolution, thanks to Alolan Muk and (in Expanded) Silent Lab. The [M] Typing probably isn’t going to matter; Jirachi isn’t for attacking, an any of the [M] Type support worth running doesn’t do much for it. 70 HP means Jirachi is a probable OHKO; [R] Weakness and [P] Resistance don’t change this too much, as the HP is just that low already. 70 HP also means it is an easy search for Level Ball but just missed out on Professor Elm’s Lecture. The Retreat Cost of [C] is very important because of Escape Board; this is the super obvious combo for the card, as it lets Jirachi serve as a “pivot Pokémon”, popping up front any time you need it to, but then retreating for free even while Asleep. Don’t worry about Slap. Jirachi isn’t suited to every Standard Format deck, but I am seeing an awful lot of it already… except in my decks because I haven’t pulled or traded for one yet. While it probably means running a few extra Trainers to get Jirachi out of the Active spot, when they’re Escape Board (reusable) or Guzma (has another big benefit), that is hardly a bad thing. I don’t know if I can stress enough that Jirachi is going to make getting such Trainers into your hand more reliable. Jirachi is an easy OHKO, but it is about as good as it gets for such a card; your opponent only gets one Prize from KOing it, you may be able to easily Bench another, your opponent has to ignore your attackers or other useful Bench-sitters while going after Jirachi, and if your opponent does spare Jirachi then you likely keep promoting it after every KO or switching card-effect to claim a bonus Trainer for the turn. Jirachi may even be worthwhile for the Expanded Format. Only skip it in the Limited Format if you pull a nice, big, Basic Pokémon-GX worth running entirely solo in a +39 a.k.a. Mulligan build. Just remember, you’re going to be manually retreating it, and paying the Energy, each time you use it; you’ll be promoting it ever few turns, when something else was KO’d. Before I rate the card, I want to add one last thing; even before seeing Jirachi in action on the PTCGO, I was fairly confident in this card. Why? It’s another pseudo-reprint. I’m not going to run through everything about Jirachi (EX – Deoxys 9/107), I’m just going to point out it has almost the same states and similar effects, most importantly a Poké-Power called “Wishing Star” that is almost the exact same as Stellar Wish. Today’s Jirachi has less raw power – the older one could grab any card in the top five – and enjoyed a slower format, but the new one is close enough that it seemed like a safe bet. Well… there is one more thing. That older Jirachi? I thought it was a bad card when we first reviewed it. Instead, it helped define that metagame… even while competing with other Bench-sitting search Pokémon, some better than what we have now. While it may not be the worst review I ever wrote in terms of writing quality, this is the biggest of my old mistakes that I still clearly remember. I’ve never forgotten how badly I blew it with that review! Re-reading it reminded me of another factor to address; existing Bench-sitters which specialize in drawing or searching may crowd Jirachi out of some decks, but Jirachi can be used in decks where they didn’t fit, while in some cases Jirachi will replace them. Jirachi will usually give you a “free” Trainer once-per-turn. Yes, Jirachi is stuck in front without some help, but its own Ability can fetch that help if it is within the top five cards of your deck, or a card to try to draw into it… and that’s if you don’t have it in hand already. Full disclosure though; Jirachi was my personal top pick from SM – Team Up. Jirachi makes the list due to having an ability that fetches cards. Stellar Wish is a very good ability even though it works on the Active AND puts itself to sleep. You get to look at the top 5 cards of your deck and grab one Trainer card you’ll find there. Trainer cards can be Item, Supporter, or Stadium cards. If you worry about whiffing, then Macgargo’s Smooth Over will guarantee you one by grabbing a trainer card and put it on top of you deck, which is already on Stellar Wish’s range to be searched. And finally, even if the Ability makes you stuck up front, Escape Board completely eliminates the drawbacks by shaving off that retreat cost of one to make it free to retreat, and still lets you retreat even if Asleep or Paralyzed. Using couple Jirachi and 4 Escape Board could be the norm. Overall, this totally eclipse Tapu Lele-GX as Jirachi can fetch any kind of Trainer cards and is worth a single prize. Jirachi (TEU 99) returns to the Standard format in the Team Up expansion set. This Team Up version TOTALLY makes up for the awful Prism Star card that was in Celestial Storm. Honestly, looking at the two cards, you would think that the TEU version is the Prism Star card. It certainly is infinitely better than its CES counterpart. I’m so sorry Jirachi for not making you my number one card overall! I’m an idiot for ranking it tenth on my list. Why don’t I listen to Otaku? Seriously, Otaku should be like the old EF Hutton commercials. “My theorymon advisor is Otaku, and he says…” chirp chirp chirp… crickets and mice. Yeah you can let your brain fall out with this card. It’s that good. I don’t even know how to describe it when you use Stellar Wish, grab something awesome, and then retreat into another Jirachi so you can Stellar Wish again. It’s almost like cheating. It’s seriously unfair. I mean, I like Dragonite A LOT – and this card is head and shoulders better than Dragonite. Maybe that was part of my problem – I didn’t want this card to be better than Dragonite … but it totally is. I traded one on Friday night for twelve TEU packs. It was a good trade, better than anything else out there on Friday night, there were some for nine or ten. But twelve? Come on, this card seriously can’t be worth twelve packs, right? Well, maybe twelve was a little high, but it is a really good card. It will help you get going early, it’s mandatory in single prize decks where you expect to lose an attacking Pokemon every turn (Lost March), and it’s forcing me to re-think the theorymon I had anticipated prior to TEU’s release. I thought we would need more Stadiums to thwart Black Market and Wondrous Labyrinth. I haven’t seen either of those cards yet, but I’m telling you right now I’m seriously considering adding Field Blowers and Lysandre Labs to my lists. Jirachi is just too good to let it grab a Trainer and then retreat back onto the bench. I wouldn’t be surprised if we don’t start seeing a LOT more Alolan Muk (SUM) too. I’d play Muk… but then I couldn’t use Jirachi. Every time I see this little guy, all I can do is think of both how many times he’s been printed in recent memory and how loudly in my head “When You Wish Upon A Star” can be played at. Jirachi is a Basic Metal Pokemon, 70 HP, with a Fire Weakness, a Psychic Resistance, and a Retreat Cost of 1. Slap is a 2-for-30 that does just what the name says. Doesn’t matter what it is you slap – the Active Pokemon, your opponent, your next-door neighbor at the table, the judge walking up to you, the judge’s kid in the stands, the officiator, your mom, your friend’s mom, your mom’s friend, whatever, you just slap em in the face while looking stoic and rigid. They know what they did. They know what they did. More useful and relevant though is the Stellar Wish Ability, which is fundamentally different from wishing you didn’t just slap a bunch of random people in the face. If Jirachi is your Active Pokemon, you get to look at the top 5 cards of your deck and pick a Trainer card to add to your hand before shuffling back the rest and putting Jirachi to Sleep so he can’t Slap anybody. Quick reminder that Trainer cards include Items, Tools, Supporters, and Stadiums. And we get to see why Jirachi is so useful – he gets you some very valuable cards for virtually no cost at all…well, except for being Active and going to Sleep. Combined with certain effects though – notably Abilities that Switch out a Pokemon from the Bench to the Active slot or a Supporter like Guzma or Item like…well, Switch, to get him out of the Active slot and put something else in, Jirachi can gain an easy advantage over the opponent, and that makes it way easier to take on opponents that haven’t been freshly slapped in the face. I think Jirachi will see some level of play, but it’s ultimately going to depend on what value you get out of the Ability while it’s Active, and if you can make the most of it before it gets KO’d. Ideally, you get to retreat it in some fashion, but as we all should know, not everything goes according to plan.